Corsair has turned into something of a PC component behemoth. Originally best known for producing high-quality RAM, the current product catalogue encompasses everything from cases, fans, cooling, chairs to peripherals. If the sums are correct, Corsair will hit $1bn of yearly revenue in 2019. Impressive as the diversification has been, venerable system RAM remains a mainstay. 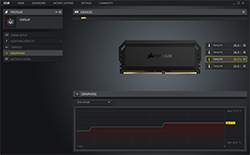 One could argue that the vagaries of IC pricing and relative lack of differentiation offer little scope for innovation and profit, yet Corsair has continually pushed the memory boat out with respect to design and performance. Today sees a new top dog in the DDR4 department, one that has some nifty new technology unique to Corsair. Enter the Dominator Platinum RGB. The company has, of course, done RGB before, then, quite literally, outshined itself with the Vengeance Pro line. That's RGB done and dusted, right? Nope. Dominator Platinum RGB looks different to all other colour-infused memory... and for good reason. Build quality is fantastic on the modules available as dual-, quad-, or octo-stick packs covering capacities from 16GB (2x8GB) to 128GB (8x16GB) and in speeds from 3,000MHz to 4,800MHz. Being creme de la creme, they certainly are not cheap, as a 16GB (2x8GB) pack of 3,200MHz memory running at performance-conductive 14-14-14-34 timings with 1.35V is set to cost £250. If that sounds pricey, the same-capacity pack of 4,800MHz memory operating at 18-24-24-46 costs, wait for it, £815. The mind-blowing cost of being at the absolute bleeding edge, eh? Other than the crazy-speed set, Corsair, as expected, retails these sticks at the very top end of enthusiast memory. So, what's so special about them, you may ask. A few things, actually. Build quality is bulletproof, thanks to beautiful aluminium construction. The sides are forged and anodised, the top bar uses die-cast zinc alloy with micro-oxidisation, while the stamped aluminium fins and brand-new light diffuser add a feeling of class. We've handled a lot of memory modules over the years; Corsair's Dominator RGB Platinum, only available in black, is the best-built. That's nice, of course, though beauty is in the eye of the holder. It's not the build that sets these sticks apart, it's the way RGB has been implemented. All current RGB modules, irrespective of manufacturer, follow a well-trodden path of using LEDs mounted on to a large surface-mount device (SMD). 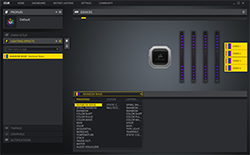 This well-established technology generally works fine because most RGB-infused products tend to be large enough to house the SMDs, meaning space isn't an obvious issue, though Corsair believes it has found a better way. Partnering with Primax, Corsair has developed a method of placing the LEDs directly on to the PCB, rather than an SMD, thus enabling a huge number of miniature LEDs to be housed in the same space as a traditional package. This new type of LED-mounting system is productised as Capellix. Corsair reckons Capellix LEDs take up just 0.2mm³ surface area, compared with 2.8mm³ for a traditional SMD. The clear benefit is that one can fit way, way more LEDs for a given area. Yet density isn't the key feature, in our minds, because Capellix LEDs are said to be up-to 60 per cent brighter, or consume up-to 40 per cent less power (at the same brightness), and have 35 per cent longer life. Now, Capellix immediately makes most sense in RGB-enabled wireless products, helping extend battery life, and it's inevitable that Corsair will be releasing such models soon, though it's first showcased here on Dominator Platinum RGB. Each module has only 12 individually-addressable Capellix LEDs evenly spaced below the light diffuser. We say only because over 100 can be placed in a space smaller than a fingernail, but Corsair doesn't see a need for such density or brightness for memory modules. You can imagine, say, 20 on a fan, 50 on a light strip, or 100 dotted around a keyboard. Back on point, the 12 LEDs are bright, really bright. Colour is punchier and more vibrant than any RGB modules we've seen. Greens, especially, really stand out through the combination of top and side diffuser. Putting back in regular RGB makes those modules feel almost washed-out in comparison. We wonder how these would have looked with 24 Capellix LEDs housed inside a larger side diffuser and full-width top bar. Lighting, as it happens, is also very even across the module, negating one of the potential problems of using ultra-bright LEDs, and the whole package elevates RGB to another level. Any downsides, then? The price premium over normal RGB is one. A second, potentially, is module height, coming in at 55mm from tip to toe. Though we are partial to it, the minimalist heatspreader may not be to everyone's taste (and it's only available in black). Dominator Platinum RGB is fully compatible with Corsair's iCUE software, and the 32GB (4x8GB) pack of DDR4-3200 CL14 (CMT32GX4M4C3200C14), featuring the enthusiast's favoured Samsung B-Die chips, can be set to one of a wide number of modes. The same software controls the modules' brightness, too. Arguably the best implementation of RGB that we have seen to date, let's now evaluate how this £500 pack of memory stacks up in the performance stakes.